I qualified as as piano teacher in 2008 which was a chosen second career after being a professional software engineer. I am passionate about music and thoroughly enjoy teaching in particular the challenges and rewards that can be gained from it. I am patient with a strong work ethic and always try to bring out the full potential of every pupil. I teach a wide range of pupils from young children to teenagers, professionals and retired adults. A small number of my pupils have special educational needs. I teach from home and work in schools, both in the State and Independent sector. This has enabled me to teach effectively a broad range of abilities from varied social backgrounds. I have also worked for a Music Service. I have successfully entered pupils for ABRSM and Trinity Guildhall exams (up to and including grade 8). I also enter pupils into local Music festivals some of whom have won their categories. Additionally. I teach Music theory in small groups whilst practical piano lessons are on a one to one basis. I treat each pupil as an individual and methodically plan all lessons which are tailored to meet their needs and aspirations My main focus is to make lessons enjoyable and engaging and there is no pressure to take exams. I am open minded to all genres of Music and am happy to teach Classical, Jazz and Contemporary Music with the intention of keeping the pupil motivated and inspired. ChristineFrom Barbara (5/5): Ava is very happy about her lessons with Christine. ChristineFrom George (5/5): Christine is great! I've learned so much in my first few weeks of lessons with her. She's very considerate with regards to what her students want to get out of the lessons and will tailor each session to help you achieve your goals. 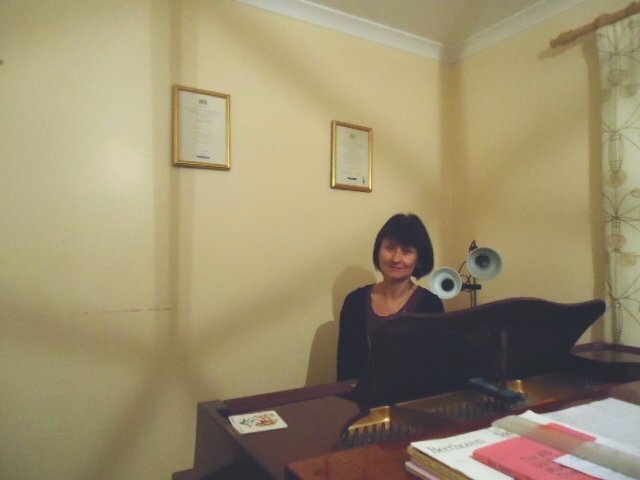 I would recommend Christine to anyone who wants to learn piano in a fun, relaxed environment. Reply from: Christine: Thanks George. I’m pleased you’re enjoying your lessons. You clearly love your music and hopefully are seeing the benefits of reading as well as playing by ear and improvising. Looking forward to your next lesson. Christine. ChristineFrom Gareth (5/5): I've had my second lesson with Christine, really impressed by how she took the time to work out what would work for me and had a great time going through the piece that Christine prepared for my lesson. I have not played piano since I was a child and Christine has really inspired me to practise and have fun learning again. I really like that the lesson structure is based around me personally. Christine is obviously very knowledgeable and I am really excited about where this new input into my life is going to take me. This has been an excellent experience so far using this website and makes me optimistic about the my future with music! Reply from: Christine: Thank you Gareth for your feedback. Everyone has their own personal goals and I always try and go with that. For me Music should be accessible and enjoyed. Thoroughly enjoying your lessons. Great fun! ChristineFrom Calvin (5/5): Thank you Christine! Really enjoying my piano lessons, Christine has a very methodical and structured approach to teaching which she has adapted to suit my style of learning which is hugely appreciated! Clearly passionate about music, she makes her lessons fun, educational and I always leave feeling more confident in my ability than when I arrive each week! Reply from: Christine: Thanks Calvin. You are progressing really well and clearly keen to learn which is fantastic. Great potential too. ChristineFrom Paul (5/5): Really enjoying my piano lessons, Christine has a very structured approach to teaching which I really appreciate and clearly has a passion for music and has a positive and encouraging approach to the student. Reply from: Christine: Thank you Paul. I’m glad you’re enjoying your lessons. I’m looking forward to seeing you develop as a player. I’m sure your advanced level of guitar playing and Music theory will help massively. ChristineFrom Dan (5/5): Thank you Christine! You have really helped me to remember the joy I find in playing the piano. After a 20 year break from playing I was nervous to start again. Your gentle, reassuring teaching style leaves me excited to practice and rediscover a love for playing I thought I had lost. Reply from: Christine: Thank you Emma. I am pleased you are enjoying getting back into your piano playing. I have no doubt that you will continue to make excellent progress and I look forward to watching you develop as a player in the weeks ahead. ChristineFrom Ray (5/5): experienced, professional and understanding. I look forward to my Piano Lessons with Christine every week. We cover the previous lesson, also she points out my mistakes that I had made. ChristineFrom Terry (5/5): Christine is an excellent tutor. She lets you learn at your own pace and is always encouraging. I would definitely recommend Christine. Reply from: Christine: Thank you Terry for your comments. I thoroughly enjoy teaching my adult pupils they are great fun and self motivated. I look forward to seeing good progress. ChristineFrom Roger (5/5): A thoroughly knowledgeable and professional Tutor. Christine exudes enthusiasm and imparts her knowledge in a structured and confident er. Highly recommended. Reply from: Christine: Thank you Roger. I look forward to teaching you in the months ahead to help you develop your skills and meet your personal goals. Reply from: Christine: Thank you Howard. I'm pleased you are enjoying your lessons. Keep up with the practise and then I am sure you will continue to make excellent progress. ChristineFrom Michael (4/5): It is still early days but Christine is already miles better than my last teacher. Plenty to practice each week with theory neatly inserted in to each lesson so no boring reading of theory books. Reply from: Christine: Thank you Michael for your comments. They are very much appreciated. Christine. ChristineFrom Nicky (5/5): Christine made our daughter feel at ease right from the start. She is clearly passionate about music which has given our daughter the inspiration to learn. Reply from: Christine: Thank you Nicky. It is great to have positive feedback I too look forward to our next lesson.